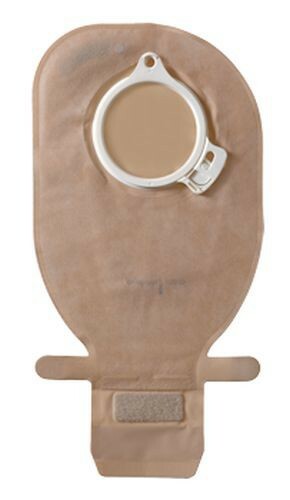 The Assura 2-Piece Drainable Pouch, by Coloplast, is a pouch that offers several features that add to the item being discreetly low-profile and while being easy to empty and clean. This innovative pouch offers the EasiClose outlet that makes draining and folding away simply and smooth, while offering a filter to help neutralize odor and stem the effects of bag swelling. This Assura 2-piece pouch includes two capacity sizes: 485 and 290mL. It also comes with soft backing fabric to make it comfortable resting against the skin while also being water repellent and easy to dry after exiting a shower or pool. The EasiClose outlet is uniquely wide making it less difficult emptying and cleaning. And it is a cinch closing the pouch with its simple hook-and-loop closure that tucks away without need for a clip or closure clamp. Coloplast utilizes their special spiral adhesive designed to accomplish two things: provide a secure adherence to the skin while absorbing any excess skin moisture to help prevent irritation. And to make matching a barrier to the pouch easy, Coloplast utilizes a color-coded system for their complete line of Assura wafers and pouches. As an example, a 'red' coupling size must be match with a 'red' pouch. The pouch has the EasiClose Wide opening for easy waste disposal and cleanup. 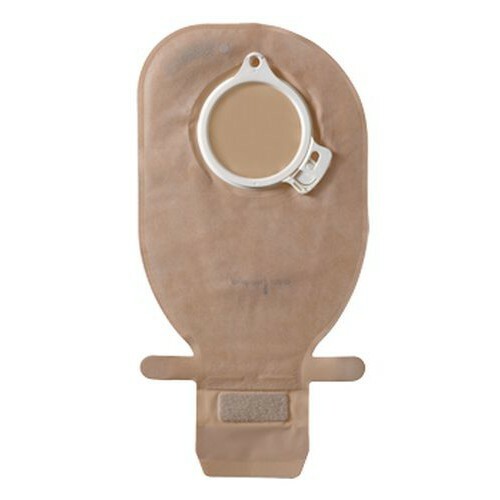 The three-layer filter on the pouch neutralizes odor and limits the risk of the pouch "ballooning" and causing unnecessary bulges. The color-coded system helps match the appropriate pouch size to the wafer. The pouch includes the "Click" style fastener so one can simply press on the wafer for an audible snap sound. It includes a spiral adhesive that both protects and soothes the skin. The closure includes a hook-and-loop fastener that simply tucks away.